This is a very simple demo of a slow mo mechanic I'm working on for virtual reality. Press the trigger to start a series of explosions that will launch the objects in the air in slow motion. 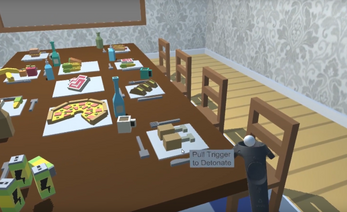 You can reach out and grab the objects or press and hold the trigger to solidify the small gray sphere and push objects around. Use the menu button to reset the scene. Finally use down on the trackpad to teleport around the room. It's a quick demo, will probably only keep you entertained for a few minutes but it's a fun mechanic that I want to implement in a future game. I think it's a great demo to show someone the magic of VR for the first time. If you have any questions please feel free to ask, I'd be more than happy to share my thoughts or code samples to fellow devs. As always comments and ecouraging words are appreciated. Extract the SlowMoVR zip file then run the SlowMoVR unity exe.